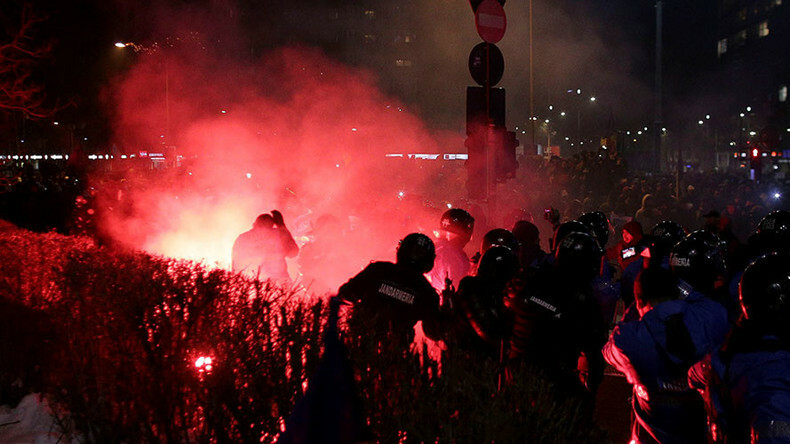 Groups of masked youths have been throwing flares, firecrackers and stones at police in central Bucharest, following a day of massive but peaceful rallies that gripped Romania over what protesters call an effective decriminalization of corruption. Up to 150,000 people rallied in front of the cabinet building in Bucharest on Wednesday, in addition to at least 100,000 across dozens of other Romanian cities, according to police estimates. Massive crowds dispersed peacefully after midnight, but small groups that remained engaged in clashes with authorities. — Adrian Pacurariu (@adrianpacurariu) 1 февраля 2017 г. At least four people were injured, including police officers, after masked protesters hurled stones, flares and fire firecrackers at police, forcing authorities to respond with tear gas. — 🇹🇷 sash® Ϝ ϓ ſ Ϟ (@slckshngz) 1 февраля 2017 г. The biggest protests in decades were triggered by a government decree that among other things decriminalizes minor graft offences, in which the sums involved are less than 200,000 lei ($48,000). — Назар Михайлюк (@NazarMykhailiuk) 1 февраля 2017 г. “Thieves, thieves,” and “Repeal it, then leave,” was heard in the streets of the capital as hundreds of thousands rallied in the capital. Most of the protesters were youth who were mobilized via Facebook, the Romania Insider reports. — Andreea Nicolaescu (@andreeanmaria) 1 февраля 2017 г. Protests have also taken place inside the parliament, where the opposition deputies put up banners reading “Shame,” and shouted “Resignation!” and “Thieves!” The centrist Liberals and the Save Romania Union USR filed a no-confidence motion against the government but has little chance of succeeding, Reuters reports. Massive protests in Romania have continued for the second night in a row following the controversial emergency decree. While Bucharest justifies the measure as a way to prevent prison overcrowding, activists argue the ruling party seeks to protect its members who are now on trial for corruption or who have already been convicted. The decree will stop a number of key investigations against Romanian politicians, including the leader of the ruling Social Democrat Party (PSD), Liviu Dragnea.